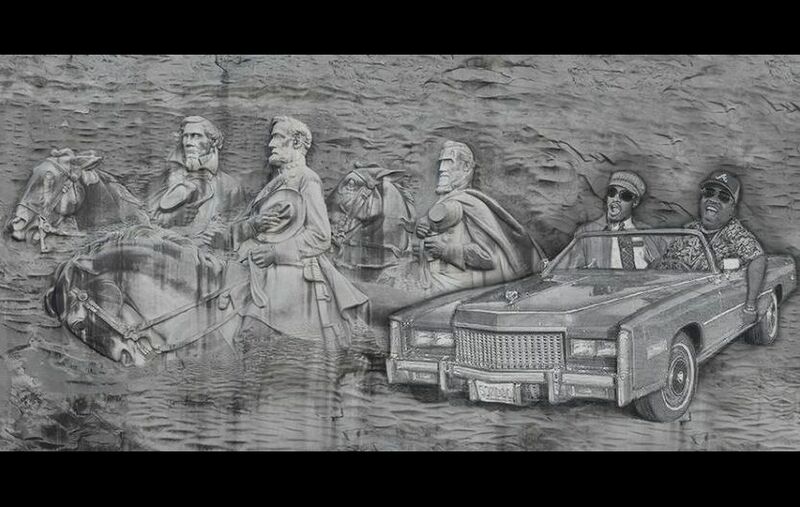 Will Outkast really end up on Stone Mountain beside the carvings of Jefferson Davis, Stonewall Jackson, and Robert E. Lee? Probably not, but it won’t hurt to sign the petition. Started by Mack Williams on Moveon.org the petition now has almost 2,000 signatures. Even if the number of signatures required is meet I feel like the government isn’t going to go for this idea. Although I think it would add some flavor to the dull looking monument. His explanation behind the petition draws from both comedic and serious aspects. Williams mentions that the monument highlights a regrettable time in the history of Georgia and also that Georgia needs more monuments recognizing the acts of great Georgians. He doesn’t wish to alter or destroy what is already craved into the monument, just add Daddy Fat Stacks and Three Stacks riding in a Cadillac. Williams thinks that Big Boi and Andre in the cadillac would just add to the confederate generals on horses. Who wouldn’t want see that? The petition has even got an endorsement from half of Outkast. Big Boi retweeted a link of the petition on twitter along with a thumbs up emoji. Below is an artists rendering of what the monument would look like if Outkast were really added to it.